I can’t believe how nice these are for the price! Our cabinetry contractor wanted $10-$20 per pull, so these were an amazing deal! You won’t be disappointed! Redecorate your cabinets with the sleek and modern solid stainless steel finished cabinet bar pulls from GlideRite. The generous case of twenty-five stainless steel bar pulls ensures that you have enough to replace the cabinet pulls in your kitchen, bathroom, and maybe both. The cabinet pulls are individually wrapped to protect the finish during shipping and storage. I got these shipped and received on time. I love the price! I looked at similar items at Home Depot and Lowe's and they were $7.21 to $8.99 per handle before taxes. These are $2 per handle, and that includes shipping. The handles have a very nice weight to them as they are solid metal. I loved the brushed steel finish instead of a shiny mirror finish as that shows fingerprints and smudges too easily. The handles each come with two 1" screws to secure it to the cabinets. The only problem I had was that my cabinets were thicker and the screw didn't reach through to the other side to secure into the handles. I had to go to Home Depot real quick to buy 1.5" screws, and then 2" screws for the cabinet drawers (which were thicker). But I don't think that's necessarily a fault of the product as everyone's cabinets may be a different thickness. I'm happy with the overall look. I will try uploading pictures if I can. GREAT product for the price! We bought these bar handles for our kitchen cabinets and cabinets in the bathroom. 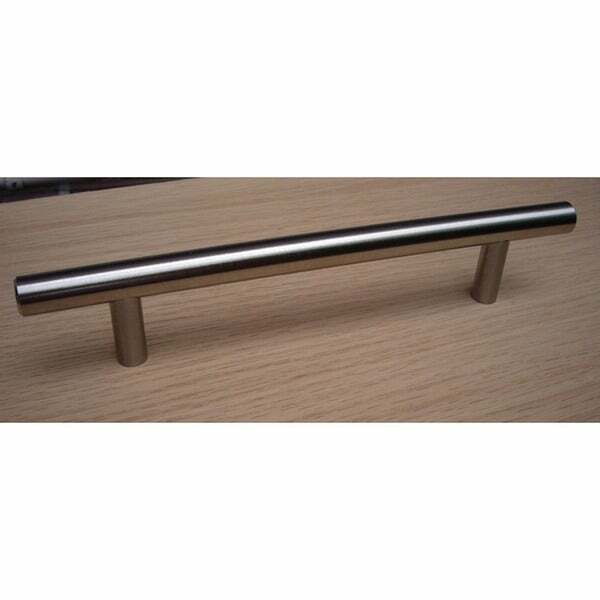 We bought 10 inch and 7 inch long bar pulls and we are very pleased with the quality and workmanship of the products. They are very solid, and look great! If anyone is looking for a clean and chick look buy these bar pulls without hesitation. Love this pulls!! they look amazing!! I installed the 10 inch one in all kitchen cabinet and they come out really really good looking and modern. And the price is really good too. I purchase another style, more expansive one from overstock for my bathroom cabinets and they turns out horrible. Do not like them at all, so I have to go with this 7-inch one to replace them all. So do not hesitate to buy this. I think they are the best pulls for your cabinets. I saw these through a local distributer, however, even their "over stock" supply, was much more expensive. These GlideRite knobs match what I saw exactly; quality, color, weight. They were very easy to install and I couldn't be happier! We paired these with the GlideRite 2-inch Solid Stainless Steel Bar Knobs on the cabinet doors and they look great! We were short only one handle and were able to purchase one at a local hardware store...paid three times as much as on Overstock! It pays to do the homework first; they go to Overstock! IDENTICAL to those in the big hardware chains! I bought 2 25-packs to replace all the pulls in my kitchen. At first, I was skeptical about what kind of quality product I should expect for $2 a pull, when they sell in the big chains for $10+ , but when they arrived, they were the EXACT same. I even bought a pull from a box store and compared it - Same, weight, same, stainless steel, same assembly, same quality - too good to be true, but trust this deal. For $100, I got $500 value of an updated, sleek look in my kitchen. These drawer pulls were better than I expected them to be. They were solid and fit perfectly. I had to re-use the screws from the previous pulls on my cabinets, as the screws provided were a little short. They would be ok if you have pressboard cabinets & drawers (because of the thickness). I do think that better packaging should be considered because of the material, as some of the pulls dislodged from their plastic sleeves during transit. Bubble wrap should be inserted in the box to protect them. All in all, I am very pleased with the product and best of all the price couldn't be beat! I saved over $ 250.00 by ordering from Overstock (Canada) even with the shipping and duty!! Love the stainless steel cabinet pulls,very good value. We also got the 10 inch and they look great in our new modern kitchen. These pulls are made of good quality heavy steel. I am completely happy i choose these pulls. I was pleasantly surprised by the quality and look of the GlideRight 7-inch stainless steel cabinet pulls. They are substantial, classy and modern. The workmanship is excellent. The size is exactly as ordered. I have already recommended this product. These handles are a great deal. We used them in a our kitchen (dark espresso cabinets). We were shopping at stores and could not believe how much money they cost per handle. Fortunately, I checked Overstock and the search was over. These handles are perfect and are not cheap in quality. In fact, they are really solid, heavy, and well made. Even the installer noted the great quality and could not believe the price. Highly Recommend!!! Just received them this weekend, ordered the 10" and 7", they are amazing quality. I saw the similar kind at Lowes and Home Depot and they were 5 times more expensive, was expecting something of lower quality. But actually these were as good if not better than the more expensive ones at the store! Three handles were falling apart had to weld them together to fix. Factory should weld them like other similar handles and this problem won't exist. Absolutely awesome price when compared to Home Improvement stores. They are holding up very well, and installed them almost a year ago. They look amazing and look like brand new still. Have gotten a lot of compliments from friends and family. These were just what I was looking for! They are heavy duty, not cheap feel or look at all. Great quality and a good price. I shopped the two national building supply stores and I saved about half my cost by using Overstock. Really nice bar pulls. We got these for our kitchen renovation and they're perfect. No complaints and exactly what we expected from the description. These are exactly what you see in the large stores but a fraction of the price! It really makes a difference in the kitchen! And....I had a few extras to use in the bathrooms- so now the whole house has matching hardware! They look great on my cabinet doors. great quality, great price! They added just the "final touch" to the refinished kitchen cabinets. These cabinet pulls are amazing! We bought a house with a kitchen in need of a total overhaul. Tired white cabinets and white ceramic knobs right out of the 80's. These pulls were the first thing I changed, and what a difference, even before all the other work was done. They look great, they are solid, and we've gotten tons of compliments on them. Great price and value. Nice handle that is solid in weight. I will be using in my bathroom to update the look. Well packaged and shipped quickly. Luv handles. 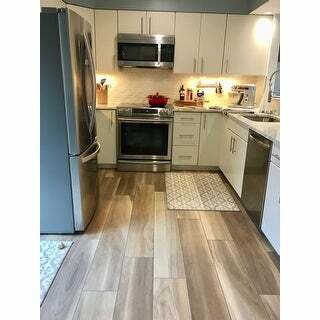 it gave cabinets a high end look. Just what I needed for my bathroom vanities. They look great. Beautiful solid cabinet pulls. Stainless steel color matches my appliances and I specifically looked for solid pulls and these are perfect! Feels expensive, super great price on overstock! Built a new addition that included a kitchen and master bathroom. I used these pills in both rooms. I loved the look and they are functional. These cabinet pulls were absolutely regal and rivaled any I saw in big box stores. They were heavy and sturdy. The sames pulls would have cost me over three times what I paid for them here. I could not be more satisfied with my purchase.and will definitely use Overstock for future purchases of this type. "What is the longest length of these pulls that you have in stock?" "Are these pulls solid stainless steel or regular steel plated with a stainless finish. I live on the ocean and need true stainless to avoid rusting." "Do these 7” cabinet pulls have 2 holes that are 3” apart?" These 7 cabinet pulls have two holes that are approximately 3 inches apart. "I need then in black stainless still but it does not say the color? " These pulls are a true stainless steel color - not black stainless steel. The description says "nickel finish", which is silver. As far as I know, they don't come in black stainless. Mine look fantastic against my dark brown cupboards, very well made. Love 'em! "Do you sell a template for drilling the holes?" Hello Donna G., these pulls do not include a template and the company does not make them. Many customers use a piece of cardboard or paper and trace where the screw holes would go. Thank you for shopping with us. "Item #13826886 states nickel finish but looks almost black. What color is it???" Hello joanpurpledragon, this item has a nickel finish. We try to represent the colors of our products accurately. Unfortunately, due to the difference in monitor colors we cannot guarantee that the color will match exactly what you see on your screen. Thank you for shopping with us. "I'm interested in these for my cabinets but I can't use them on my drawers because they stick out too far. Any other suggestions? Anything compatible with these that could be used on drawers, needs to have less than a 1 inch projection?" Hello dwolvert. Unfortunately we do not carry any bar pull that has the same look with the projection of less than 1”. All of our traditional bar pulls have a 1” projection or more. Please let us know if you have any further questions.
. The generous case of twenty-five stainless steel bar pulls ensures that you have enough to replace the cabinet pulls in your kitchen, bathroom, and maybe both. The cabinet pulls are individually wrapped to protect the finish during shipping and storage.